1) This paper has been prepared as part of FIG Commission 3 WG 3.2 (Spatial Data Infrastructure) project. Interim reports of the project have been presented at the Commission 3 Workshop “Spatial Information for Sustainable Management of Urban Areas” in Mainz, Germany, 2-4 February 2009 and will be presented at the FIG Working Week in Eilat, Israel, 3-8 May 2009. Final report will be presented at the FIG Congress in Sydney, Australia in April 2010. In 2007 FIG Commission 3 has originated the Working Group WG3.2 Spatial Data Infrastructures in Mega cities, which proposes to identify relevant spatial tools that will support development and use of spatial data infrastructure (SDI) by city authorities in the world’s largest cities. In this context the working group has adopted a pragmatic approach, based on working with administrations in mega cities to identify key problems they face both nowadays and in the future. Furthermore it is planned to access an international network of experienced spatial information practitioners to identify solutions and in a last step to develop materials which will provide for a toolkit of SDI best practices to be used for the purpose of city management. Until now the working group has developed a questionnaire about current problems facing mega cities and their current use of SDI, which was distributed in early 2008 to city administrations in 13 mega cities (Kelly, 2008). Supplementary and independently to this direct correspondence one important objective is to undertake background research including a literature and internet investigation of existing sources to gather information about use of SDI in mega cities. This paper presents the results of an internet investigation, which collected information about use of SDI in the world’s largest metropolitan areas. A metropolitan area in this context is defined as an urban agglomeration with more than 10 million inhabitants, which by now is true for 26 cities in the world (http://www.citypopulation.de/world/Agglomerations.html). The following sections provide at first a short overview of general NSDI development for all countries of the world holding at least one mega city. According to that countrywide view the use of SDI or comparable initiatives in the associated metropolitan areas is being described. The last section of the article conducts an evaluation of the results of the internet investigation. Leaving legislative and organizational SDI aspects aside the evaluation constrains on the technical aspects of the use of spatial information technology in mega city management. The results of the study are given in form of a classification of different development stages existing both at national and urban levels. The classification is done on basis of usability and accessibility of spatial data which could be identified by the internet search. NSDI in Egypt is still rudimental and has to deal with a number of bottlenecks such as weakness of partnerships, lack of digital data and metadata, absence of a clear institutional framework, shortage of access and sharing mechanisms to search for data, lack of national standards and also a scarcity of qualified specialists. Considering the underdeveloped NSDI of Egypt it is no surprise, that for the city of Cairo no information concerning SDI development or comparable initiatives could be found. Facilitate cooperation and collaboration among stakeholders in generating Geospatial Databases for development of SDI at National, State and local levels in Nigeria. Eliminate duplication in the acquisition and maintenance of Geospatial data. Promote investments in the production of geospatial databases. Promote research, training, education and capacity building related to geospatial data production, management and usage. In 2007 the government of Lagos state constituted a committee for the provision of a fully digital mapping and enterprise GIS for Lagos State. The policy framework adopted by the administration for the development of Lagos State should be reached by generation and sharing of information with organised private sector, developing skilled and knowledgeable workers. The mapping products that should be delivered as a result of this project should be at the scale of 1:500 for metropolitan Lagos and at 1:1.000 for rural areas. Other scheduled products include: orthophotos (scale 1:2.000), contour lines (scale 1:500 for urban and 1:1.000 for rural areas) and Digital Elevation Models. In Bangladesh no official NSDI exists. SDI conform initiatives were initiated by the “Bangladesh Society of Geoinformatics” in 2006. Its mission is to build up capacity in Geoinformatics within governmental and non governmental agencies and to guide and assist the distribution of Geoinformation technology, sharing of ideas, information and knowledge among users, professionals and institutions. One of the objectives is to promote and assist establishment of the National Spatial Data Infrastructure (NSDI) in Bangladesh. In accordance with the rudimental national SDI initiatives in Bangladesh also in Dhaka neither city SDI nor any WebGIS application or similar could be identified. China has paid great attention to construct the Digital China Geospatial Framework (DCGF). This NSDI has four layers at National, Provincial, Municipal and County level. A series of fundamental geospatial databases was completed as the kernel of DCGF. A fully digital nationwide geospatial data production system is widely established. The national coordinating mechanism is in action to strengthen the cooperation and data sharing and the national standards are getting more complete to support the DCGF (Li et al. 2008). In 2002 the Shanghai Municipal Government announced the “Digital City Shanghai” strategy. In this context a distributed WebGIS application for managing landscape resources was developed (Zhu et al. 2005), which allows the connection of all landscape bureaus of the city where data are kept locally for maintenance and updates. These data are also available online to the central bureau and other local bureaus. Beyond data exchange functions the GIS provides for spatial analysis functionality like distance-based spatial queries, for selection functions and for different types of buffering functions. In 2004 the city authority of Guangzhou, the capital city of south China, initiated the Digital Municipality of Guangzhou (DigiM.GZ) project, which is scheduled for a life span until 2010. The project aims to represent the Guangzhou metropolitan area as a digitalized virtual municipality by using a wide range of up-to-date GIS and telecommunications technologies. When in use it shall provide for a universal platform to deal with all digital data relevant for city planning, management and maintenance, including water, gas and power supply, transport network, drainage and telecommunications. In Beijing the Beijing Digital Green Management Information System is available, which consists of a GIS, remote sensing data, 3D virtual simulation, database, high-speed broadband networks and other hi-tech products. It integrates a database of Beijing landscaping areas and a database of social, economic, ecological and urban infrastructure. This system is constructed of components for integrated Management, system maintenance, dynamic garden inspecting, integrated query, planning, building maintenance, environmental benefits evaluation, 3D simulation, and other subsystems. The NSDI scheme in India (established in 2001) aims at using GIS to merge satellite imagery and ancient topographic maps with data on water resources, flooding, rainfall, crop patterns, and civic layouts to produce 3-D digital maps. NSDI should, once ready, act as an online database to maintain spatial data layers and base maps in an easily retrievable form. 40 major cities should be mapped at a scale of 1:1000, and in later phases the entire country should be covered. Another objective of the Indian NSDI is to achieve a national coverage of all forest maps, land use, groundwater and wasteland maps, pollution data, meteorological department's weather-info and department of ocean development's sea maps. The key elements for development of NSDI are: standards (to enable interoperability; standards for network, gateways, protocols etc. ), evolving metadata, nodes (GIS-based spatial database servers), search and access protocols, electronic clearing house, creating user interfaces, and initiating an NSDI outreach and awareness program. For these purposes India has developed a Geoportal. In 2005/06 in the handni Chowk area of the walled city of Delhi, which covers an area of about 20 km² size, a pilot study on generating a 3D-GIS database was accomplished. The database was created by using a base map at scale 1:2500, high resolution satellite data, ground control points, videos of the area, high resolution DEM from LiDAR/ ALTM and by 3D GIS data processing and analysis software. In the future the database should be expanded for the entire city and should provide for a basis for monitoring the city and for development of different applications for urban planning. In Mumbai various GIS applications for small areas with different aims have been made. The Mumbai Metropolitan Region Development Authority (MMRDA) recognized the usefulness of this technology and thus proposes in its Regional Plan (1996-2011) to build up a Regional Information System where the spatial and related attribute data should be organized and shared among the local authorities, planning agencies and other institutions working in the region. One of these developments should be taken by the Collective Research Initiative Trust (CRIT), who plans to generate an open-access spatial data infrastructure and a set of simple tools and applications for knowledge transfer and participatory urban planning by communities and citizens in Mumbai. Until now the normal Internet user has only access to a demo version with some basic spatial data. During the Survey and Mapping National Coordination Meeting in 2000, ISDI, the Indonesian SDI was declared to become a primary solution to solve the problems of the availability of and access to geospatial data (Abdulharis et al. 2005). Bakosurtanal is the coordinating agency for the development of Indonesian NSDI (Arief Syafi’I, 2006). The NSDI aims at improvement of coordination mechanism, completion of spatial databases and national metadata developments, activation of national clearinghouse (Puntodewo et al. 2007) and development of Digital Indonesia. Agency’s spatial databases should be completed and should work within a nationally and globally integrated distributed system. A national clearinghouse prototype and a metadata gateway should be developed and metadata servers should be installed in key agencies. The city of Jakarta provides for a very simple WebGIS application, which represents the road network of the city and enables different search functions to find streets and points of interest. No further SDI-activities in the city were recognized. In Iran, national organisations, ministry and municipal offices as well as private companies are active in the field of mapping and geographic information production. The national organisations concentrate their efforts on small-scale base mapping of the whole country. Governmental surveying offices and private companies are mostly involved in high resolution geographic information production needed for national and provincial projects (Baktash 2003). Most research in the fields of photogrammetry, remote sensing, GIS and digital mapping is carried out in the national organisations, institutions and universities (Rad et al. 2004). However, a few private companies also made remarkable research efforts for commercial products and services. The Tehran municipality, Public & International Relations Department committed to the development of a WebGIS with more than 140 layers, which should be launched before the end of the current Iranian year. The application should serve citizens and managers of various organisations and institutions as well as domestic and foreign tourists with needed information. In Japan the NSDI is implemented by the Geographical Survey Institute (GSI) and different ministries, who began their work on the Spatial Data Framework in 1995 and completed it in 2003. Over the period of development the institutions produced a collection of base maps, notably the topographical map series of 1:25.000, which covers the whole country. Those maps were used for generating several public and private sector maps like administration area maps, road maps and also several thematic maps (Land Use Map, Land Condition Map, Volcanic Land Condition Map, Map of Active Faults in Urban Area, etc). Beyond these maps also aerial photographs were published and the development of a national standard was established. The future work of the Japanese NSDI concentrates on a new infrastructure concept, which is promoted as "Digital Japan" and which shall lead to a virtual and real-time representation of the land realized by integrating geographic information of various kind and which shall be made accessible to anyone on the internet. Concerning the two Japanese mega cities Osaka and Tokyo the internet investigation could not extract any specific SDI-initiatives. Both cities developed long-term master plans, where principal goals for city planning are formulated but no SDI strategy could be identified. The first phase of a NSDI Master Plan for South Korea was completed by the year 2000. The main purpose of the first phase was to establish basic GIS infrastructure by producing various kind of digital maps. The second phase of the NSDI, which started in 2001, concentrated on spreading GIS applications for maintaining the digital maps and developing national standards (Han et al. 2001). The city of Seoul has at its disposal a widespread SDI on the technical base of several distributed GIS applications like Urban Planning Information System, Road Information System, Soil Information System, and other municipal affairs Information Systems. A Spatial Data Warehouse is available which provides for sharing and accessing the different geospatial data of the GIS systems via a GIS Portal system. A map viewer program even allows analyses of the retrieved data. Up to present in Pakistan no official NSDI was established. Only some SDI-supporting-initiatives exist (Asmat 2008), one from which should be mentioned as the Winner of GSDI Association Small Grant 2006-7. Under the aegis of the WWF this initiative develops a SDI for sharing environmental information. From the inception of the project large amounts of geospatial data including satellite imagery, digital vector data, and digital terrain models were acquired and developed. In its “Megacities Preparation Project” from 2005 Karachi’s government schedules the development of digital maps of the city by using GIS technologies. Yet this project could not be finalized. First official activities for establishing a NSDI in Philippines were initiated in 2001 under the umbrella of the National Geographic Information Council (NGIC). The central mapping agency of the government of the Philippines (NAMRIA) keeps all base maps such as topographic maps in different scales, aerial photographs and satellite images. NAMRIA also produces different thematic maps such as for land condition, land cover, land use, planimetric and administrative maps. As a member of a developing country Metro Manila has not yet a comprehensive SDI available. A Disaster Management Information System called “Metro Manila Map Viewer” was developed in 2004, which allows users to retrieve useful information and maps from datasets including hazards, transportation, public facilities, emergency services, elevation, land use/zoning, and high-resolution imagery. In 2004 a feasibility study on NSDI was initiated by Geo-Informatics and Space Technology Development Agency (GISTDA) with grant support from the U.S. Trade and Development Agency (USTDA) for Thailand. The study could show various problems particularly concerning data sharing and data usage. Development of NSDI fits in very well with the Thai Government’s scheme on a comprehensive utilization of Information Technologies to support administration and public services. The key mechanism is the development of e-Government in which GIS forms a key component which plays an important role in providing for dynamic information to support better governance of the country. A collection of geospatial data are available from the Royal Thai Survey, which provides for data in analogue and digital format (information available only in Thai language). For the city of Bangkok only a webpage in Thai language could be found. This webpage seems to grant access to a comprehensive collection of geospatial data in different GIS applications. As Francois Salgé states’France is creating a NSDI without knowing it. Thus NSDI is not per se an issue in the French context’ (www.ec-gis.org/ginie/sdi_ws/france.ppt ) Consequently there is no explicit overall governmental initiative to develop an NSDI in France even though a Geo- Portal was launched in 2006 and a multitude of NSDI-like initiatives are being undertaken. Russia is just at the beginning in developing a NSDI. The concept dating from 2006 schedules a three stage process, which should be finalized by 2015 with the implementation of the national NSDI. The concept shall be transferred into a distributed system for collecting, processing, storage and delivery of basic geospatial data and metadata. The system shall comprise subsystem levels of government and local governments and shall users grant remote access to digital databases of geospatial data and metadata. For the city of Moscow no specific SDI solution information could be found during the internet investigation. Currently, the Military Mapping Agency of Turkey is the main data producer of spatial data and has the most visible internet presence offering limited metadata for its own products. There are several persisting problems in the field of SDI in Turkey: lack of coordination between institutions; no standardization, neither with regard to the spatial reference system, nor to data quality or data exchange; data duplication; the majority of large scale data not available in digital format; interoperability does not (yet) exist; lack of expert personnel and budget; and a lot of difficulties to share data. Istanbul's Water and Sewerage Administration (ISKI) developed the Infrastructure Information System (ISKABIS) to control and manage extensive water and wastewater facilities for the Istanbul Metropolitan Area. The system is based on a file server system application to achieve effective data sharing. Within the file server system various folders like maps, raster, infrastructure, superstructure, planning projects etc. are categorized in a similar way as a digital library. Each department in ISKI, such as mapping dept., GIS dept., Water Project dept., Sewerage Project dept. etc, has to update exclusively the folder which it is responsible for. More than 30 applications are implemented in ISKABIS CAD/GIS program. Ultimate Map Management, Infrastructure Management, Projects Management, Address Query, Building Query, Cadastral Query, Geographical Information System Applications, Easy Print Utility etc. can be made via ISKABIS. The city administration of Istanbul provides for a WebGIS, which represents the road network for the metropolitan area of Istanbul containing a precise division into lots and house numbers, orthofotos of different years and a range of thematic information, as well. Although in 1995 the National Geospatial Data Framework (NGDF) initiative was launched, there is yet no formal NSDI in the UK, or a single organization with responsibility for its establishment and coordination. On the other hand, the country as a whole has a well developed GI sector, with extensive datasets available from both public and private sector sources (McLaren et al, 2000). Various efforts have been undertaken to implement a broad metadata service but these have not been sustainable. The government of the city of London provides for the City Online Maps Project Accessing Spatial Systems (COMPASS), which aims at improving access to information about the city of London through a unique access point so that residents and those visiting the city are better informed. A wide range of data is available on the site such as where to find your nearest services and information about planning policies affecting the city. One remarkable SDI conform application in London is the Newham Neighbourhood Information Management System (NIMS), where users gain access to data on economic, social and environmental conditions of the borough. Maps, charts, data download is available, as well as generating of online reports and performance information. In 1998 the first activities concerning NSDI were initiated in the federal republic of Argentina by the SIGRA group (Geographic Information System of the Argentine Republic) and the National Mapping Agency (IGM) leading to the NSDI implementation in 2001. In 2005 the National Geographic Information System of the Republic of Argentina (PROSIGA) started as an Internet distributed GIS, in which seven specific SDI working groups are present: Institutional framework, Policy and Agreements, Fundamental and Basic Data, Metadata and Catalogues, Diffusion and Communication, Training, Search Engine for Geographic Names and IT for SDIs. The department of Geographic Information Systems of the city administration of Buenos Aires developed a widespread WebGIS application built up on open source components and integrating a multiplicity of geospatial data of the city. The GIS covers a range of applications like health, education, tourism, sports, culture, leisure, green spaces, social services, transportation etc. and enables access to information up to parcel units (currently it is possible to view for most of the parcels a photograph showing the parcel-related buildings). The department also provides for thematic maps, which are based upon the GIS data and can be ordered in digital or analogue format. In Brazil the Ministry of Budget Planning and Management is responsible for the Brazilian NSDI, with strong participation of the Brazilian Institute of Geography and Statistics (IBGE) and the National Institute of Space Research (INPE). The Brazilian cartographic community, in particular Federal Government agencies, made great efforts to constitute a NSDI in Brazil. The IBGE launched map servers offering diverse information and providing for geodata of the whole country. The department for planning of the city of Sao Paulo makes an internet portal available, which enables access to a multiplicity of statistical data, thematic maps and also allows for the vizualisation of infrastructural data in a WebGIS client. For Rio de Janeiro the department of city planning offers digital maps and databases of the municipality of Rio in a Geoportal and also allows for download of statistical tables, maps and spatial data. Mexico’s NSDI initiative is called the “Infraestructura de Datos Espaciales de México” or IDEMEX. The Mexican NSDI implementation is led by the National Institute of Geography, Statistics and Informatics (INEGI) since 1997 (Albites 2008). INEGI developed an internet presence (GeoPortal), where users can view and download a series of geodata, including appropriate metadata (Ramírez 2005). The Interactive Atlas Nacional de Mexico (ANIM) on this website shows in an exemplary way the provision of public information. The user is capable of viewing geographical information from various sources through a single interface. For the Mexican mega city Mexico City the internet investigation did not extract any specific SDI-like-initiative. The United States clearinghouse was established in 1994 with the US Federal Geographic Data Committee (FGDC) responsibility of NSDI implementation (Clinton 1994). In 2004 still the NSDI major development focus was almost completely restricted to the United States federal level (Steven 2005). Geospatial Data are provided in a nationwide Geoportal offering a multiplicity of functions to access, publish and share geospatial data in a widespread number of categories. Concerning city SDI initiatives in 2008 the New York City government has published its IT strategy for the next years (NYC PlanIT). The strategic plan describes a framework for how the City will leverage general information technology in the years ahead to improve New Yorkers’ lives. Especially the plan discusses the utilization of spatial data. By now an Interactive City Map of New York provides for information on the topics transportation, education, public safety, resident service and city life. The office of Emergency Management operates a GIS, which maps and accesses data — from flood zones and local infrastructure to population density and blocked roads — before, during, and after an emergency case. Beyond that the City government runs a spatially-enabled public website called ACCESS NYC, which has the capability to identify and to screen for over 30 City, State, and Federal human service benefit programs to explore appropriate services for the individual users needs. The Los Angeles government publishes a collection of interactive maps containing information on traffic, parcels, flooding, city services, leisure etc. From the internet investigation a wide range of different development stages of geospatial data handling in the examined countries and their associated mega cites emerged. Certainly this reality basically is determined by different social, economic and political conditions given in different countries and cities. In such a context global comparison of the results is difficult. Thus formal criteria have to be defined in order to set an objective evaluation framework. The main focus of the evaluation concentrates on the technical part of geospatial data handling while omitting the institutional and legislative SDI aspects. The evaluation framework consists of five categories which are designed to classify all investigated items. The list of items not only contains the mega cities themselves but also their home countries, because a city is part of a country and, therefore, should be part of the NSDI of its mother country, as well. If, for whatever reason, only few information on an item could be found on the web, the corresponding item was marked with ‘SDI development status unknown’. If initial activities towards SDI development were observed the status ‘SDI master plan available’ was given. Further definition of the classification schema differentiates primary from secondary geospatial data. Primary geospatial data are original data, like survey data, data with limited interpretation like water bodies or boundaries, which are obtained without analysis or very less interpretation. Secondary data are thematic data which are derived from the analysis of primary data, statistical data collection and/or image interpretation. This differentiation is in accordance with the GSDI Cookbook (http://gsdi.org/docs2004/Cookbook/cookbookV2.0.pdf), with the guidelines of the European INSPIRE initiative (http://inspire.jrc.ec.europa.eu/) and with the Australian Spatial Data Infrastructure (http://www.anzlic.org.au/policies.html) which all define primary data in terms of ‘Fundamental Data’ or similarly ’Global -’, ‘National -’, ‘Framework -’, ‘Base -’ , ‘Reference -’, and ‘Core Data. Even if the requirements concerning geospatial information are considerably different at national and urban level, the overall differentiation in ‘primary spatial data available’ and ‘secondary spatial data available’ provides for a common basis for classification. Another important finding of the internet investigation was the fact that the process of SDI development in many of the searched countries and cities currently is in the stage of digital data production. However, the captured data often are not yet available via a Geoportal or a similar distributed web application. To reflect this finding the classification schema differentiates between availability of geospatial data and accessibility of data. Regarding the progress of geospatial data handling in the home countries of mega cities the result of the internet investigation shows a large diversity (Tab. 1). 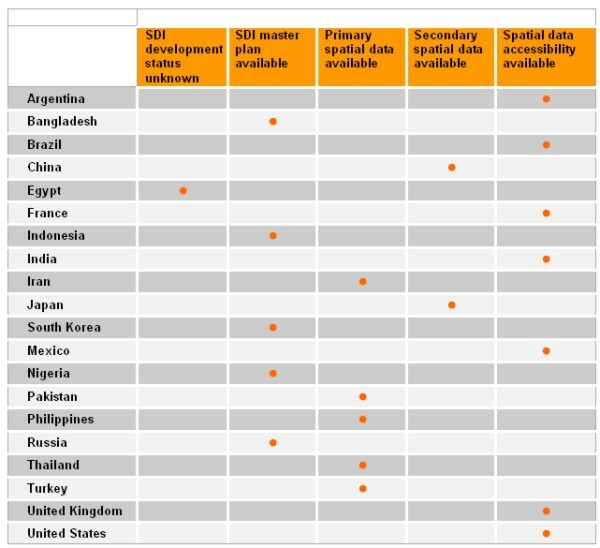 Some countries like Russia or Nigeria are just at the beginning of developing a NSDI, while other countries are at the stage of producing primary data (e.g. Iran, Pakistan) and also secondary data (e.g. China, Japan). It also can be shown, that the progress in developing a NSDI is well advanced in Europe and Pan-America and India, where users already have access on geospatial data via distributed web applications. The internet investigation of the status of geospatial data handling in the mega cities proved to be more difficult than for the counties hosting mega cities because less publication does exist concerning this topic. Moreover, some of the cities only provide information in their national language, which, due to lack of language ability of the authors, could not be analyzed. . Nevertheless it can be stated that like in the home countries of the mega cities the application of spatial information technology in the mega cities of the world is largely diverse. Tab. 2 shows the availability of digital geospatial data in the considered mega cities. The application of spatial information technology in the cities under consideration varies from the provision of very simple WebGIS applications which only show the road network and some less basic information like in Jakarta or Mumbai over applications which enable the presentation of social, economic, ecological and urban information related to the city (e.g. Buenos Aires, Los Angeles, Paris) and ending up with comprehensive distributed information systems which can be found e.g. in Seoul, London or New York City. Abdulharis, R., van Loenen, B., Zevenbergen, B. (2005): Legal Aspects of Access to Geo-Information within Indonesian Spatial Data Infrastructure. ISPRS Workshop on Service and Application of Spatial Data Infrastructure, XXXVI (4/W6), Oct.14-16, Hangzhou, China. Albites, F.A.H. (2008): Relationships of Cartography, Geographic Information Systems and the Mexican Spatial Data Infrastructure (IDEMEX). The International Archives of the Photogrammetry, Remote Sensing and Spatial Information Sciences. Vol. XXXVII. Part B4. Beijing. Arief Syafi’I, M. (2006): The Integration of Land and Marine Spatial Data Set as part of Indonesian Spatial Data Infrastructure Development. Seventeenth United Nations Regional Cartographic Conference for Asia and the Pacific. Bangkok. Asmat, A. (2008): Potential of Public Private Partnership for NSDI implementation in Pakistan. Master-Thesis, Enschede. National Cartographic Center of Iran’s Activities about it. Proceedings of the 2nd FIG Regional Conference, Marrakech, Morocco. Cheng, P., Rao, J. (2006): Digim.GZ -- The Digital Municipality of Guangzhou Project. Clinton, William (1994): Coordinating Geographic Data Acquisition and Access: The National Spatial Data Infrastructure. Executive Order 12906, April 13, 1994, Federal Register, 59 (71), pp.17671-17674. Han, S., Cho, H. (2001): Development of National Spatial Data Infrastructure in Korea. Proceedings of the Technical Conference during the FIG Working Week. Seoul, South Korea. 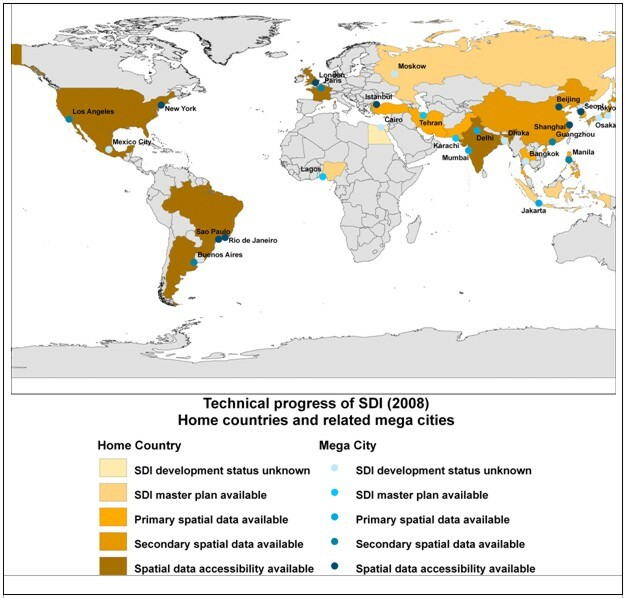 Kelly, P. (2008): Current Problems and Issues in Using SDI in Mega cities. Report of FIG Working Group 3.2: Spatial Data Infrastructures in Mega cities, unpublished. Li, P., Lan W., Xuenian X. (2008): SDI in China: Progress and issues. The International Archives of the Photogrammetry, Remote Sensing and Spatial Information Sciences. Vol. XXXVII. Part B4. Beijing 2008. McLaren, R., Mahoney, R. (2000): NSDI in the UK. http://www.fig.net/pub/proceedings/prague-final-papers/mclaren.htm. Quo Vadis - International Conference FIG Working Week 2000, 21-26 May, Prague. Puntodewo, Nataprawira, R. (2007): Indonesian Geospatial Data Clearinghouse. Proceedings of the 3rd FIG Regional Conference, Jakarta, Indonesia. Rad, A.E., Sarpoulaki, M. (2004): Islamic Republic of Iran National Report for Photogrammetry and Remote Sensing 2000-2004. Proceedings of ISPRS Commission VI, ISPRS Congress. Istanbul. Ramírez, J.O. (2005): The Spatial Data Infrastructure of México "IDEMex". From Pharaohs to Geoinformatics, FIG Working Week 2005 and GSDI-8, Cairo, Egypt April 16-21. Steven, A.R. (2005): The US National Spatial Data Infrastructure: What is new? ISPRS Workshop on Service and Application of Spatial Data Infrastructure, XXXVI(4/W6), Oct.14-16, Hangzhou, China. Zhu, Y., Yang, C., Wong, D.W., Kafatos, M. (2005): A Distributed GIS for Managing Shanghai Landscape Resources. Geographic Information Sciences, Vol 11, No. 1. Hartmut Müller got his diploma and doctoral degree at Karlsruhe University. After 8 years of research he turned into the marketing and software development departments of international enterprises for 6 years. Since 1991 he has been working as a professor at Mainz University of Applied sciences. Since 1998 he has been a member of the board of i3mainz, Institute for Spatial Information and Surveying Technology. In the DVW – German Association of Geodesy, Geoinformation and Land Management he is the chair of working group 2 -Geoinformation and Geodata Management. Silke Boos holds a diploma in Geography and a Master degree in Geoinformatics. She currently works as scientific co-worker at the i3mainz institute.